United and BudK should be embarrassed by this knife. The design isnt bad other than ring is on ring finger instead of pinky so doesnt work as an impact. This is the worst stainless steel I have ever had to try to sharpen. UC2732 stainless steel? Ultimate Crud steel. Sorry but thats the main flaw. At 7.98$ not even worth sending back. I at least have a pc that I can show off as worse than pakistani steel. This knife is well made and a nice little unit. It is for small hands. It is uncomfortable in my hands. And it would be difficult to get it out in an emergency. It is just to small. Received the item rather quickly. Good feel and right size but would be better if the sheath was designed with two holes on top so it can also be worn around the neck which is my preferred carry method. The blade is not too long, which doesn't need to be since I would only deploy it when things get really hairy in my line of work. This Sonic-Karambit fits good on my hands but after slashing just cardboad it hurts my fingers. I sharpened it a little more. The package comes with the screw to adjust the sheath. Awesome price sweet neck knife. Sheath is great addition little mod to remove belt loop now its my go to everyday neck knife. It's not sharp, but the point does better than expected. I've used it to pierce a few pieces of leather for halters and even jammed it through some roofing pieces to see if the odd shape would hurt my hand (striking downward or forward with it depending on your grip is ok, trying to rip with it or push the edge forward cranks oddly on whichever finger ends up with the open loop). The cutting edge hones well, but it'd never replace a good drop point pocket knife. I've modified the case, which is really well made for something under 20 bucks, to sit more along the inside of my belt within reach of my back pocket. There's been a few occasions where I've reached for my wallet and felt comfortable knowing I had the full loop there to quickly and discreetly arm myself. I'm rather certain the point could shockingly pierce any protective clothing someone may have on. I've been shocked each time I've found something to test a strike on at how well it does what it's supposed to do. I read that some practitioners who use karambits in their daily duty use them to restrain people by wedging the blade in between the forearm's bone. As rough as that sounds I have no doubt this item could do that easily. This Karambit is one of the first items I purchased from BUDK. It was shipped as promised in good condition and secure packaging. Blade is not shipped very sharp. Pros: Elegant design Solid, single piece construction with good thumb grip Nice sheath Cons: A bit small for average size hands Sheath quickly lost a bolt Relative size of the UC Sonic was difficult to judge by the pictures. The description "5 3/8" stainless steel blade" is misleading - this is the OVERALL length of the knife.The BLADE itself is only a couple of inches long (THIS WILL CONTINUE TO BE A PROBLEM WITH BUDK - lack of accurate measurements). The ring itself is large, but the two scalloped curves give very little room for the rest of the fingers when using an index through the ring in a downward grip. Upward grip is find with the ring finger in the ring. The missing bolt was replaced with a mismatched find at the local hardware store. 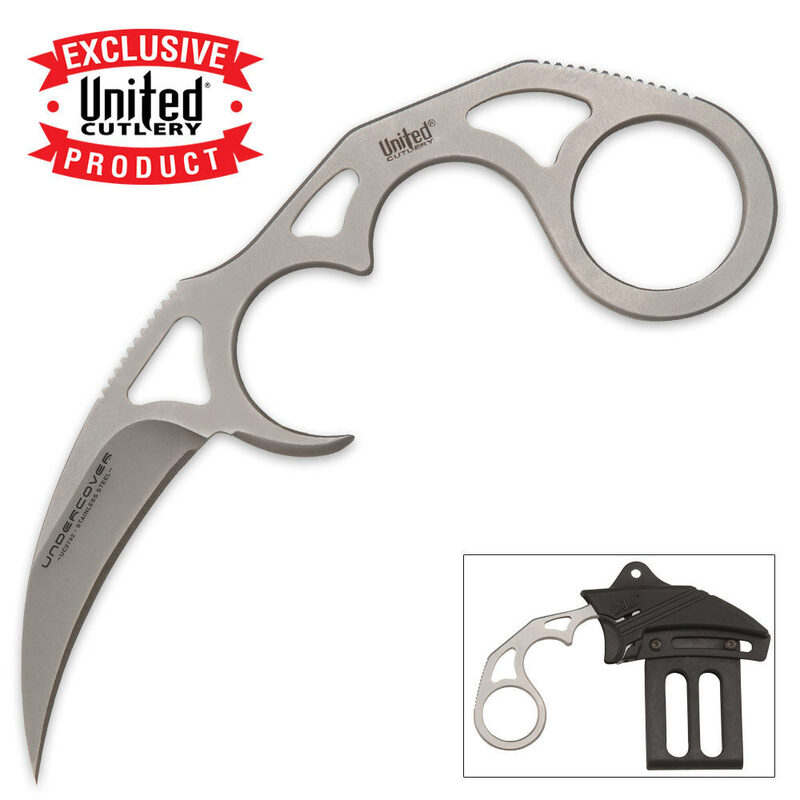 i got 2 of these as a present from a friend, im glad he didnt pay very much for these to say the least...cause after one use of trying to cut some cardboard of all things cardboard, one of these karambits blades snapped right in two...i get the fact you get what you pay for and since they ae as cheap as they are i should have not expected much better...with that said, they are really cool looking but feel bad that my friend paid for something that broke that easily...but then again ive noticed that alot of the United Cutlery blades are made of cheap 440 and 420 steel which in turn reflects the price here on BudK...which just proves if ou want a good knife your gonna have to pay a little for it. Cheap, dull, and super small. Doesn't fit comfortably in the Hands. This karambit, like most of bud k's items is just crap. It looks cool, but I wouldn't trust my life to it. Pass on this one, you will be disappointed.